Comparative texts about Sacred Days and Seasons (inc Sabbath) from DSS, Mishnah, Babylonian Talmud, etc. Primary comparative texts of Rabbinic Wisdom (inc Sabbath and Passover restrictions) from Mahlon H. Smith's Into His Own: Perspective on the World of Jesus, Rutgers University. XXXVI.10-47; XXXVII.1-3; Tatian's Diatessaron (c. 150-160). From Augustine's Tractates on John: Tractate XLIV (Chapter 9). "Religion is assaulted most by the pretence of religion: but the more it is pressed down, the more it rises up." "This poor man could not see Christ, but Christ saw him. And if we know or apprehend anything of Christ, it is because we were first known of him." "So had God opened the eyes of his understanding, as well as his bodily eyes." "We are not justified in asserting that the sufferer is a sinner." Healing of a Man Born Blind, audio telling, story in episodes, graphic, audio and written commentaries. Go Tell Communications, Biblical Storytelling for the Global Village, 2011. Commentary, John 9:1-41 (Lent 4A), Meda Stamper, Preaching This Week, WorkingPreacher.org, 2011. "As the fruit of Jesus' vine, we are on display and stand for something Other." dirt 'n spit 'n life, Fr. Rick Moley, a garden path, 2011. "Let's not look on people like they're poor slobs, and wonder at how blessed we are. Let's reach out - into the dirt - if we have to. Let's dirty our hands. And let's bring the Life that Jesus brings." "It has been suggested that the origins of denominations occurred when the healed blind men met each other." Exegesis and Sermon Suggestions, "Sight and Insight," John R.Brokhoff, SermonSuite, 2011. "With a whole chapter for a preaching text, many themes are possible coming from individual texts that may not be related to the overall theme of the chapter. Some of these may or may not be connected with the miracle of giving sight to a man born blind." "Some passages are simply too rich to be only heard. They need to be experienced. Such is the case with this week's story of the man born blind in John 9." "Creative Sin," Russell Rathbun, The Hardest Question, 2011. "The Pharisees, in John, see God work as restrictive. Jesus sees God’s work as permissive." "If I’ve learnt in this life that there are two types of questions, then I’ve also discovered that there are two types of question-askers. There are those who want to ask questions, and there are those who want to discover answers." "Jesus, the Blind Man, and Spiritual Vision," Reflections on John 9:1-41, Alyce McKenzie, Edgy Exegesis, Patheos, 2011. "Our text, John 9:1-41, is Jesus' sixth sign in the Gospel of John. It shows us what the Prologue has already told us: that he is the One sent from God to be the light of the world." Holy Textures, Understanding the Bible in its own time and in ours, John 9:1-41, David Ewart, 2011. "Jeremiah 5:21 would be a good text to introduce this story: 'Hear this, O foolish and senseless people, who have eyes, but do not see, who have ears, but do not hear.' Jesus can cure the blind. Getting us to see past our own self-interest - to see the glory of God in the lowest and the least - now THAT would be a real miracle." "Nancy Eiesland, Associate Professor of Sociology of Religion at Emory University in Atlanta, is one of a number of theologians that have spent a lot of time in recent years studying our text for today as well as related texts. They are working on what has been called a 'liberation theology of disability.'" Commentary, John 9:1-41, Karoline Lewis, Preaching This Week, WorkingPreacher.org, 2008. "First Thoughts on Year A Gospel Passages in the Lectionary: Lent 4," William Loader, Murdoch University, Uniting Church in Australia. "Obsession with observance is a characteristic of religion which makes it very dangerous, as many forms of fundamentalism have shown, not least the recent most violent. Such rigidity at the expense of people is not, however, limited to certain widely acknowledged types, but can flourish on both the left wing and the right, among the biblicists and among those serving other ideologies." "Jesus and the Man Born Blind," Gospel Analysis, Sermons from Seattle, Pastor Edward F. Markquart, Grace Lutheran Church, Seattle, Washington. Detailed background and exegesis. "The Pharisees had their blind spots and we too have personal blind spots." "We cannot be light to the world until we can see that light in the eyes of beggars in our town and in our global village, welcoming that light as Christ's presence among us and receiving each bearer as a neighbor, a brother or sister with a face and a name." "Things Done in the Dark," Paul Bellan-Boyer, I heard of a city called Heaven. "Yes, we already know quite enough about darkness. The problem is when we walk in darkness, when we?re accustomed to it, we need the light to show us the way out." "Third Sunday in Lent: John 9:1-41," New Sight, New Life: Lenten Gospels, Gracia Grindal, Word & World: Theology for Christian Ministry, Luther Northwestern Theological School, 1996. "The Gift of True Sight," Larry Broding's Word-Sunday.Com: A Catholic Resource for This Sunday's Gospel. Adult Study, Children's Story, Family Activity, Support Materials. "Have you ever played a game with a blindfold? Or, have you ever been on a trust walk, where you are blindfolded and led by another person?" "That God Might Be Glorified," Rev. Bryan Findlayson, Lectionary Bible Studies and Sermons, Pumpkin Cottage Ministry Resources. Includes detailed textual notes. "The Light of the World (John 9)," by Robert Deffinbaugh at the Biblical Studies Foundation. "Our Lord came not only to deal with the symptom of suffering, but its root, which is sin." "The blind man received sight physically; this led him to see spiritually as well. But the Pharisees, who claimed to possess spiritual sight, are spiritually blinded." Lectionary Commentary and Preaching Paths (Lent A4), by Jirair Tashjian, at The Christian Resource Institute. "There is no suggestion here that we believe uncritically anything that comes along. On the other hand, humility in the presence of God?s mysterious ways is a proper attitude to have." "Behold My Servant," David L. Roth, in Kerux: The Online Journal of Biblical Theology (Reformed). "John 9, then, is about this light. It is about Jesus?light sent from the Father. It is about Jesus whose life is the light of men. And I suppose John 9 is about darkness too. At least in so far as the failure of the darkness is concerned. The failure of the darkness to comprehend (or "overpower") the light." "The images of the blind in the New Testament have stigmatized and made ill the very people that the stories discussed curing. This paper considers, from a blind woman psychologist's perspective, ways to revision these images to heal both the blind individual and the faith community." "The Disabled God," Burton Cooper, Louisville Presbyterian Theological Seminary. Theology Today 1992. "I have learned some things from listening to Christians with disabilities, and I am persuaded that by thinking of God as disabled-metaphorically, of course-we can deepen our understanding of the nature of God's creative and redemptive love." Cooper, Burton, "The Disabled God," Theology Today, 1992. Craddock, Fred B., "Coping in Jesus' Absence," The Christian Century, 1990. Farmer, David Albert, "John 9," Interpretation, 1996. Grigsby, Bruce, "Washing in the Pool of Siloam -- A Thematic Anticipation of the Johannine Cross," Novum Testamentum, 1985. Lischer, Richard, "Acknowledgment," The Christian Century, 1999. Painter, John, "John 9 and the Interpretation of the Fourth Gospel," Journal for the Study of the New Testament, 1986. Staley, Jeffrey L., "Stumbling in the Dark, Reaching for the Light: Reading Character in John 5 and 9," Semeia, 1991. Streets, Frederick J., "Light," The Christian Century, 1993. Taylor, Barbara Brown, "Willing to Believe," The Christian Century, 1996. Thatcher, Tom, "The Sabbath Trick: Unstable Irony in the Fourth Gospel," Journal for the Study of the New Testament, 1999. Wynn, Kerry H., "Johannine Healings and the Otherness of Disability," Perspectives in Religious Studies, 2007. "Jesus the Magician," Bishop William H. Willimon, Day 1, 2010. "Poirot or Corot: On Asking the Right Questions," J. Barrie Shepherd, 2003. Covenant Network of Presbyterians. "Seeing Is Believing," the Rev. J. Barrie Shepherd, 2004. Covenant Network of Presbyterians. "Blindness," Pastor Edward F. Markquart, Grace Lutheran Church, Seattle, Washington - Sermons from Seattle. "Jesus Heals the Sick," Illustrating the Story (lessons, children's sermons), coloring pages, activity sheets, crafts, children's songs. MSSS Crafts. "To God Be the Glory," Charles Kirkpatrick, Sermons4kids.com. "Jesus Heals a Blind Man on the Sabbath," Sunday School Lessons: Family Bible Study, art projects, music, stories, etc. 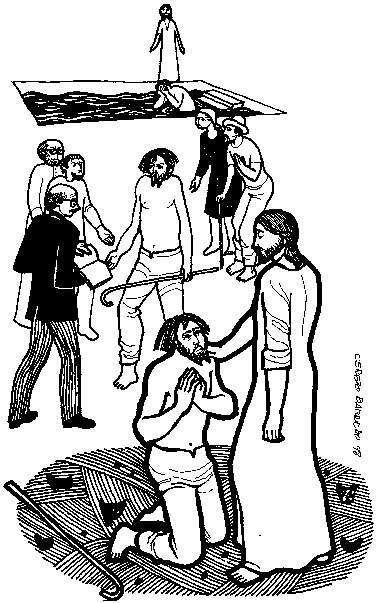 "Jesus Heals the Blind Man," children's study, puzzles, coloring sheet, etc. Higher Praise Christian Center. Jesus Heals a Blind Man Wordsearch, Jesus Performs a Miracle word jumble, sermons4kids.com. John 9:25, memory verse activity, MSSS Crafts and Resources for Bible Stories. "Man Born Blind," Reader's Theater, Lisa Ann Moss Degrenia, 2012. "The Man Born Blind," Andy Lund, dramatix. "Separation of Church and State," Jon Segroves and Tangelia Cannon, dramatix. Clip Art, John 9:7, Fr. Richard Lonsdale, Resources for Catholic Educators. John 9:1-41, Lectionary Clipart, Hermanoleon Clipart. John 9:1-41, at Cerezo Barredo's weekly gospel illustration. Liberation emphasis. Hymns with Scripture Allusions: John 9:4, 25, 31. The Cyber Hymnal.